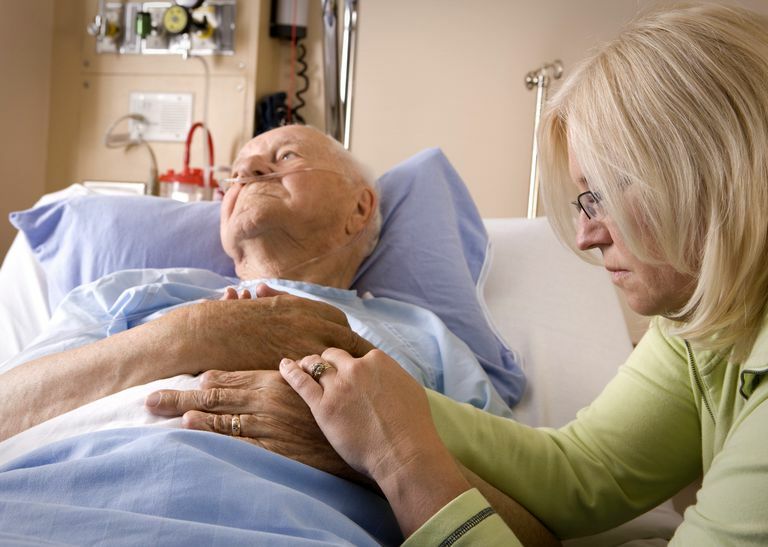 Pressure ulcers are a common problem in palliative care patients. Decreased mobility, increased time spent in bed, and altered nutrition make these patients prime targets for skin breakdown. Pressure ulcers are painful. As a caregiver, one of the most important things you can do to keep your patient comfortable is to prevent one from developing. Turning a patient who is bed bound is the most important thing you can do to prevent pressure ulcers from occurring. Frequent turning alternates areas of pressure on bony areas, such as the lower back, hips, elbows, and heels. You should plan on turning your loved one every two hours, alternating between the right and left sides and lay him flat on his back. Every two hours is ideal but there is no need to set an alarm clock to wake you up every couple of hours at night. If you and your patient are sleeping comfortably, leave well enough alone. If he does wake you up in the middle of the night, however, take that opportunity to turn him. It's easy to lose track of which side he should be turned to if he's been on his back for a while. One family I met had a simple solution for this. They used a soft cotton wristband to mark the side that their grandmother should be turned to next. The grandmother liked the idea as well because the wristband was pink — her favorite color! When you’re positioning him in bed, pillows are your best friend. Use one under the back to prop him on his side; place one between the knees when he's on his side; use one under the ankles to “float” his heels off the bed. Pillows add comfort and can reduce pressure on bony areas. If your loved one is spending most of the day in a recliner chair, repositioning him is still important. Small adjustments in seating position are often effective enough at relieving pressure. Keeping a folded draw sheet underneath him while he's sitting will make this task easier. When it’s time to reposition him, simply hold the draw sheet (preferably with the help of another able-bodied person) and slightly shift his weight. You can also try changing the degree of recline to redistribute body weight. In addition to turning and repositioning frequently, using a special surface to reduce or relieve pressure can help a great deal. The simplest of these is an egg crate mattress. Many hospice and home health agencies provide these free of charge but they are relatively inexpensive at your local department store. If your loved one is spending a lot of time up in a chair, egg crate chair pads are also available. An egg crate surface helps distribute pressure more evenly, helping minimize the amount of pressure on one area. A step up from the egg crate mattress is an air mattress overlay. This type of surface is placed on top of a mattress and typically alternates air pressure in various columns. When using an egg crate mattress or an air mattress overlay, it’s still important to maintain the turning schedule. These devices don’t replace frequent repositioning. The big guns of pressure relieving devices are the fluidized air mattresses. These special mattresses contain silicone-coated glass beads that become fluid when the air is pumped through them. These mattresses do a wonderful job of relieving pressure but they have their downside. The frame of the mattress makes transferring to and from bed difficult. And if the person wants to sit up in bed, a foam wedge would probably need to be used to help support their back. This mattress is really best suited for palliative care patients who are fully bed-bound, have severe pressure ulcers, and are in a lot of pain. Friction is the rubbing of skin on an external surface, usually bed sheets. Friction to the most commonly affected areas can be reduced with protective devices. Heel and elbow cradles are typically made of egg-crate material and Velcro on. Skin protecting dressings, such as films (Tegaderm) and thin hydrocolloid bandages (Duoderm) can protect the skin from repeated friction but won’t help reduce pressure. The most important thing you can do to prevent injury from friction is to make sure you don’t create any yourself when you’re repositioning your loved one. Use a draw sheet to help you lift your loved one off the bed when you lift and reposition. Shear is created when the deeper fatty tissues and blood vessels are damaged by a combination of friction and gravity. The best way to avoid this type of injury is to avoid a semi-Fowler and upright position in bed. A semi-fowler position is where the head is raised less than 30 degrees and upright positions more than 30 degrees. Now, you obviously can’t avoid these positions all of the time. Many patients need to be semi-Fowler to help ease shortness of breath or prevent gastric reflux and all patients need to be in an upright position to eat safely. To minimize the risk of shear injury in a semi-Fowler or upright position, take precautions to prevent your loved one from sliding down in bed. You can do this by raising the foot of the bed and propping the knees up with pillows. Shear injury can happen in chairs too. To keep your patient from sliding in his chair, use footstools or ottomans to prop his feet and pillows or special devices to keep his hips at a 90-degree angle. There is a strong correlation between nutrition deficits and pressure ulcer risk. If your loved one has an appetite, try to maintain adequate nutrition with nutrient-rich foods (think lean proteins, whole grains, fruits, and vegetables). If his appetite is waning, offer supplements such as Ensure or Boost to help bolster nutrition. Nutrition is often a problem in palliative care patients and it’s important to note here that you should never try to “force” your loved one to eat. Moisture from sweat, urine, or feces can be damaging to skin. It’s important to maintain the skin’s integrity by managing the moisture. If a patient accumulates a lot of moisture from sweat, he will need his clothing and possibly his sheets changed frequently. You can make this easy on yourself by using hospital gowns or other clothing that slips on and off easily. Using several layers of sheets can also make this task easy. One family I cared for started the day by layering the bed with three cotton sheets and simply removed one when it became damp. If your loved one is incontinent of urine, he will need frequent changing of his adult diapers or pull-ups. Checking his diaper at least every two hours and changing it as soon as it is soiled is important. Using skin barrier creams can help prevent damage from urine. It’s the same principle as preventing diaper rash in babies. Use Desitin, A&D Ointment, or another similar product to protect the skin from moisture and acidity from the urine. If he's also incontinent of stool, he's at an increased risk of skin breakdown from the bacteria and digestive enzymes found in bowel movements. He will need to be cleaned and changed as soon as possible after every bowel movement. This can be quite a challenge if your patient suffers from diarrhea or has frequent bowel movements. But it will be well worth the hard work if it prevents painful skin breakdown. Preventing pressure ulcers can be hard work. It’s physically exhausting to lift, turn, position, clean, and change another person every couple of hours. Like most things that require hard work, the payoff is huge. Keeping your loved one free of painful pressure sores will make all the physical labor seem well worth it. If you find you’re having difficulty maintaining the job yourself, you may need to seek additional support. Kayser-Jones J, et al. Pressure ulcers among terminally ill nursing home residents. Research in Gerontological Nursing 2008;1(1):14-24.